The New Synagogue in Berlin Mitte was once the biggest synagogue in Germany. Due to the growing Jewish community in Berlin, that counted 28,000 members in 1860, it was decided that there was a need for a bigger and more representative place of worship. The synagogue that was planned, offered up to 3,000 seats. It was designed by Eduard Knoblauch. After he fell ill, his friend the architect Friedrich August Stüler completed his work. Today the remaining part of the synagogue is a protected historical monument. 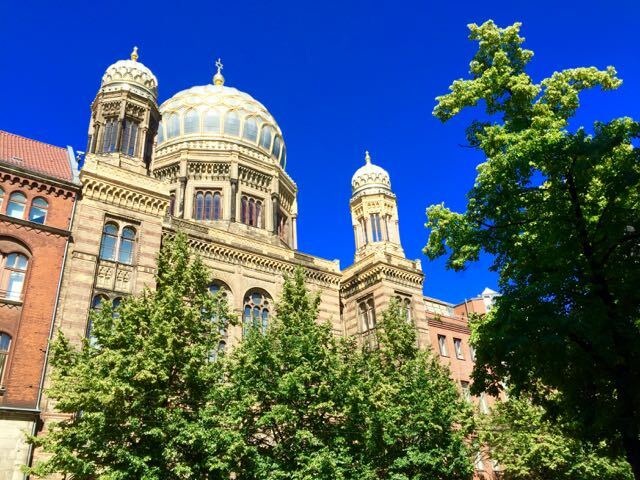 If you are walking down Oranienburger Straße you will see the amazing, gold shining dome of the synagogue from afar. It is a beautiful sight and shapes the face of the street. The façade shows the splendid eastern Moorish style in which the whole synagogue was once built. It was meant to resemble the architecture of the Alhambra in southern Spain. During the pogrom night the synagogue was torched, but saved by the district chief of police and fire fighters. It suffered however severe damages during World War II. The reconstruction was initiated only in 1988. The façade on Oranienburger Straße was the only part that could be reconstructed from original parts. Everything else was destroyed. A small congregation is now using part of the New Synagogue again. The other parts of the Synagogue function mainly as room for exhibitions. You can learn about the history of Jewish life in Berlin. Security is very tight, so don´t forget your passport. Bags have to be locked away. One should be aware that the old splendor of the interior design of the New Synagogue was almost completely demolished during the war and therefore can no longer be seen. Opening Hours: October to March: Monday to Thursday and Sunday: 10 a.m. – 6 p.m. Friday: 10 a.m. – 3 p.m. April to September: Monday to Friday: 10 a.m. – 6 p.m. Sunday: 10 a.m. – 7 p.m.